Stamped Sophisticates: Flirty Flowers Stamp Set from Stampin' Up! A lovely flower set from Stampin' Up! I'm not sure which I like best on this card. The new Flirty Flowers stamp set or the Powder Pink background created with the Layered Leaves 3D Dynamic Textured Impressions Embossing Folder. Wait. 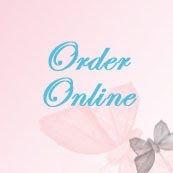 Maybe its the beautiful Powder Pink bow made with the 1/2" Finely Woven Powder Pink Ribbon I like the most... I guess I just love how it all works together! The basecard is Powder Pink, then a layer of Whisper White and then a background layer of Powder Pink dry embossed with the Layered Leaves embossing folder. The flower is stamped on an oval cut with the Stitched Shapes framelit. The sentiment is stamped on a small circle also cut with the Stitched Shapes framelit. I mounted the sentiment on Dimensionals, and glued the flower image oval directly to the dry embossed background. I masked the stems of the flower when I inked the flower and bud, and then removed the mask and used an Old Olive Write Marker to ink the stems. 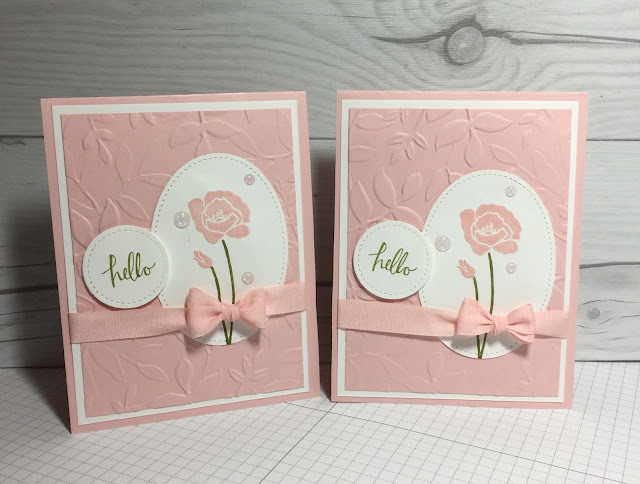 To embellish the card, I used the Powder Pink ribbon and the Glimmer dots. Such lovely additions to this card. 1. 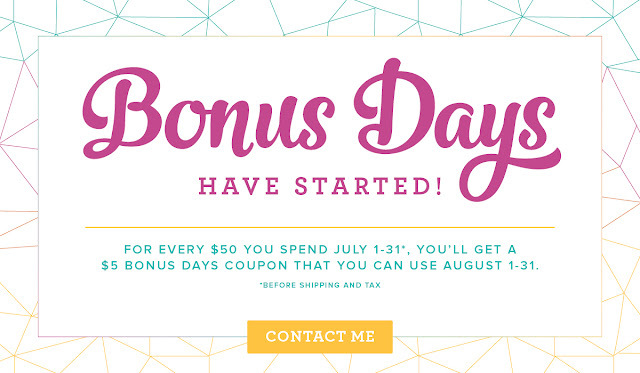 Earn a $5 coupon for each $50 purchases you make in July. Download a free .pdf of the catalog, to see hundreds of new products you really must have. 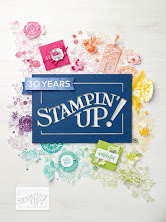 Orders over US$150 (not including tax and shipping) qualify you for stampin' rewards -- free merchandise you select and add to your order totalling 10% of your order. And, then you'll receive an email with three $5 coupon numbers you can redeem for catalog merchandise during August. Wow! 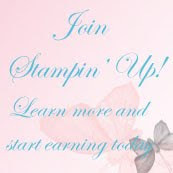 Spend $150 and get $180 worth of merchandise!--$15 in Stampin' Rewards with your July order and another $15 to spend in August. Not a bad deal! 2. 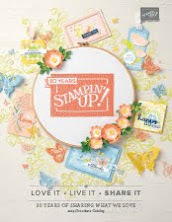 Becoming a demonstrator during July can save you 20% or more on your purchases, and as a Stampin' Up! demonstrator you'll get even more rewards. Its like Christmas in July!